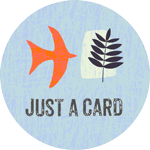 Last week, I took delivery of my new collection of greetings cards designed around the subject of nature, focusing on my favourite wild animals and birds. It is always exciting when new cards arrive from the printers, seeing them for the first time. The quality of the print is fantastic and has really captured and brought to life my unique glimpses of nature. Today, I shall give you an insight into the designing of ‘ The Big Cat Reserve‘ and why I have chosen these impressive wild animals. 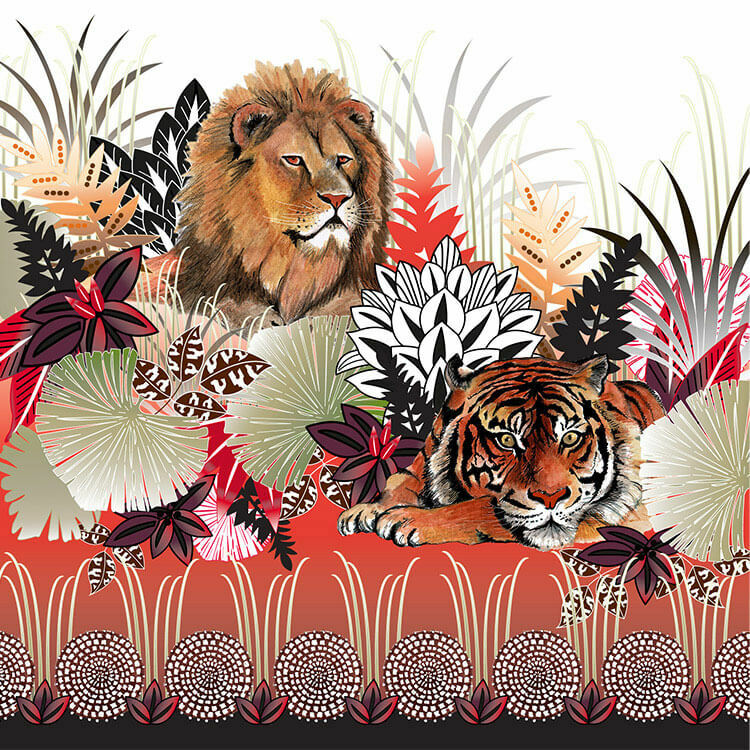 This exotic card with its red ombré background, has to be my favourite as it features the majestic lion alongside the magnificent tiger. Although these wonderful creatures come from different continents, the lion from Africa and the Tiger from Asia, I have brought them together in a tranquil scene, resting in the heat of the day, cooling off in the wild undergrowth. To really capture their natural beauty I have used water-colour paints and pencils to bring them to life. All the decorative leaves and grasses are created in Illustrator. I love mixing media, hand-painted with the precise and accurate line, colour and shading of Illustrator and forming an imaginary habitat in Photoshop. The design grows from a black band at the base where grasses and are leaves spaced with ethnic, tribal patterned circles forming a decorative foreground border. Unfortunately, the beauty and power of these wonderful animals make them endangered species; instead of holding them in awe we hunt them down! Thankfully, after the killing of Cecil – the famous and much-loved lion – last year by an American dentist the there has been a backlash against trophy-hunting and lions will be added to the endangered animal list. We see these iconic big cats depicted all around us in our everyday lives. The lion symbolises courage and strength, and their likeness in statues feature prominently in many ancient cultures at the entrance of ancient cities to keep evil spirits away. Here in England, the most famous statues are by Landseer in Trafalgar Square. The tiger is the largest of the cat family and is probably the most striking, with its distinctive stripes and colour. Our admiration for this animal can be seen mainly in fashion – there is no need to kill to wear this unique striped pattern. It can be created and imitated in design; printed on materials ranging from silk to fake fur, and we love it! I recently spotted the scarf shown on the left below, in a charity shop. I adore the all-over pattern featuring not only the lion and tiger, but also another big cat favourite of mine, the leopard. This can be seen in my original card collection and my home accessories. Upon looking around to find other contemporary cards on this subject, I found it quite difficult to find nature mixed with decorative design. The majority of greetings cards with the lion and tiger as subjects are either illustrative, cartoon-like amusing cards or beautifully snapped photographs. In my selection below, the ‘Happy Birthday’ card from Paperchase sits between the illustrative and modern captions card. 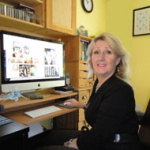 To find most of my card examples, I visited Fine Art America where I found versions of stunning art, printed on cards. 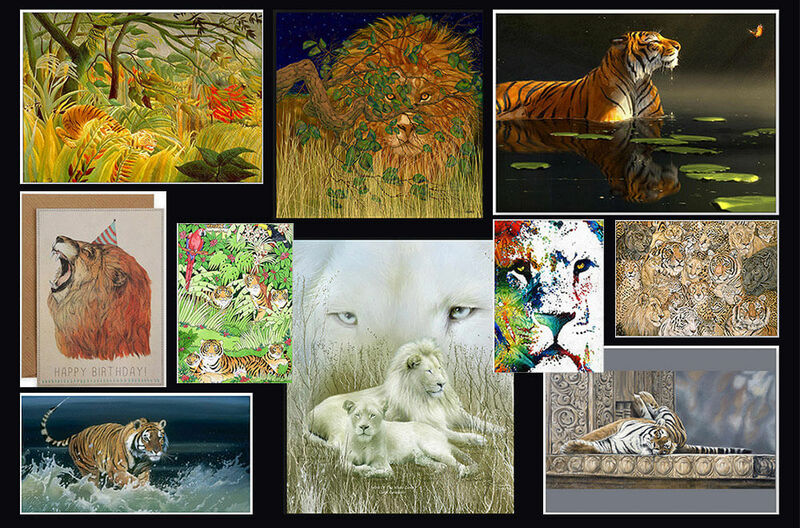 From Rousseau’s primitive ‘Tiger in a Tropical Storm’ to the inventive ‘Cosmic Lion’ behind the branch, to the clarity of the tiger in a lily pond called the ‘Butterfly Contemplation’ and finally to the ‘Big Cat Greeting Card’ – with a lazy tiger posing for the picture, they are all inspirational. On Trend: Flamingos and Pineapples!